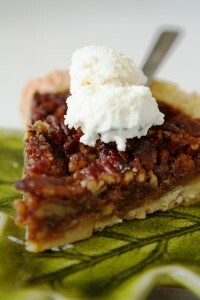 Pecan pie is a must have Thanksgiving tradition. I make it every year. 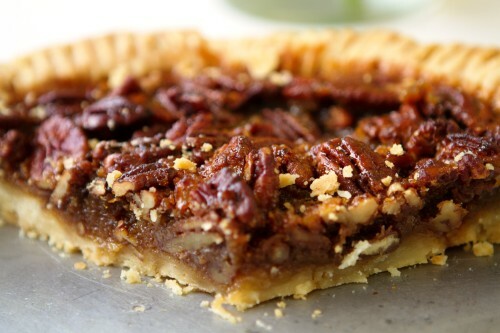 The addition of a little bit of orange or lemon zest changes this pecan pie completely. It heightens the flavor of the pecans in the same way salt intensifies chocolate. Pecans are available in India at Crawford market. Native to Mexico this nut is high in fiber, iron, protein and minerals. They should be kept refrigerated in an airtight bag. Preheat oven to 350°F with a tray on the middle rack. Roll out chilled dough on a clean, flat, lightly floured surface with a lightly floured belan or rolling pin. Roll gently from the center of the dough outwards on four sides to create a 12-inch round. Don’t press too hard and do not handle the chilled dough too much. Heat from your hands will decrease chances of a flaky pastry. Unlike dough for chappatis, short crust pastry must be handled gently. Lay out rolled pastry into the 9-inch pie plate. Leave a 1/2-inch overhang or flap over the pie dish rim to accommodate shrinking. Indian maida shrinks much more when baked than European and American varieties. Gently fold overhang and lightly press against rim of pie plate with a fork. Lightly prick the pastry all over with a fork or if you plan to use pie weights cull the pasty first and then place the pie weights inside the pie dish before baking. Plastic wrap and return to the refrigerator. Bake pie crust 20 minutes. Meanwhile melt butter and brown sugar in a heavy bottomed saucepan over low heat. When the syrup is smooth remove from heat and stir in t corn syrup, zest, and salt. Then stir vanilla, nutmeg (if using) and eggs beating well to incorporate. Stir in only the broken pecan pieces . Reserve the whole pecans. Remove crust and let cool 20 minutes. Lower oven heat to 325F. Pour pecan mixture into the pastry shell until it is almost full. Lay the whole pecans in the mixture and return to the oven to bake about 30-40 minutes until set but still a bit jiggly. Don’t over bake. A good pecan pie must have a firm top and a slightly gooey interior. Warm in a 325F oven about 15 minutes before slicing and serve with bourbon whipped cream or cold vanilla ice cream. 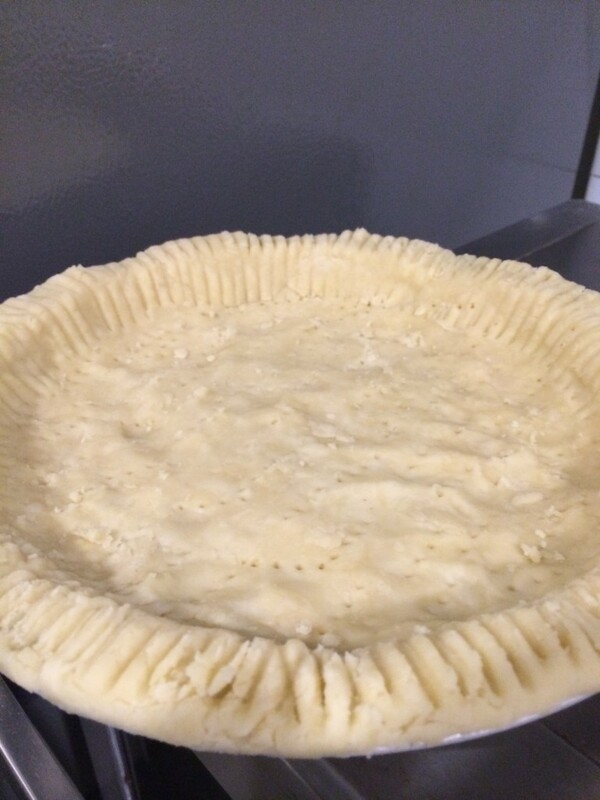 To prevent the crust from shrinking during blind baking, make sure to roll the pastry so it is larger than the pan and overhangs the tart or quiche pan’s edge. Use pie weights or make even holes all over the pastry and the edges using a small fork. The cooled quiche can be served warm and covered and refrigerated for up to 2 days. 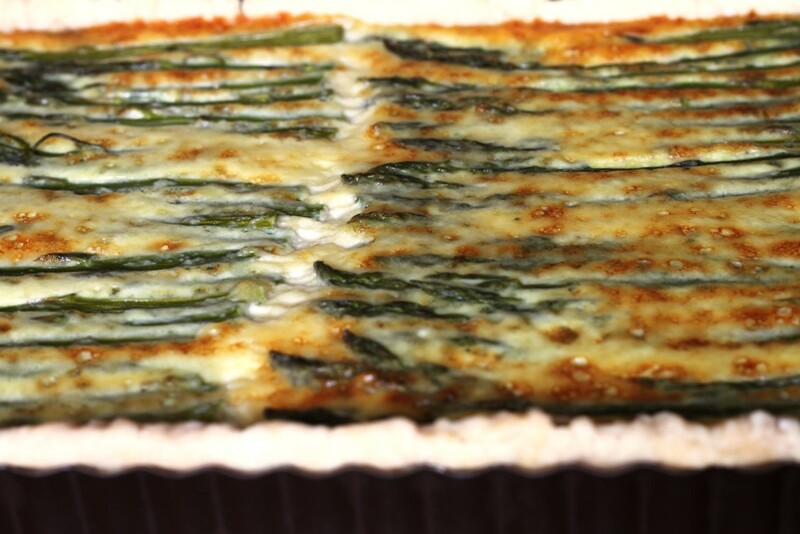 To reheat the quiche, place it on a baking sheet on the middle rack of a 325-degree oven for 15 minutes. 1.FOR THE DOUGH: Process flour and butter in a food processor and pulse until butter and flour form small pearl size granules about ten seconds of pulsing. Or do this by hand using a fork or a pastry tool. Mix flour and butter until breadcrumbs form. Don't over handle butter and flour, mix slowly and gently. 2. Add ¼ cup ice water until combined. Pulse 1-2 seconds or mix by hand using your fork or pastry tool. Pinch dough with fingers; if dough is floury, dry, and does not hold together, add 1 to 2 tablespoons ice water and mix until dough comes together in a loose ball. 3. Turn dough out onto clean and floured work surface and flatten into 5-6-inch disk; don't work the dough. The less it is handled the flakier the pastry. Cover disk in plastic wrap and refrigerate 1 hour, before rolling. (Dough can be refrigerated for up to 24 hours but then you need to thaw is 10-12 minutes before rolling. 4. Roll out disk of dough on floured work surface to 12 by 8-inch rectangle or 11 inch round (about ¼ inch thick). Roll dough loosely around rolling pin and unroll into quiche pan. Working around circumference, ease dough into pan. Trim any dough that extends more than 1 inch over edge of pan. Patch any cracks or holes with leftover. Press dough gently to fit into pan. Using a fork press holes all over the dough. If you have pie weights you can use these instead just before the crust goes into the oven. Refrigerate dough-lined pan until firm, about 20 minutes, and then freeze for 30 minutes. 6. Adjust oven rack to middle position and heat oven to 350 degrees. Fill with pie weights or dried beans. Use strips of foil or a pie protector to cover the edges of the pastry. This prevents excessive browning. Bake until exposed edges of dough are beginning to turn golden 35- 40 minutes. Carefully remove quiche pan and empty out pie weights. Remove shell from oven. Lower temperature to 325. Brush hot interiors of pastry lightly with a little whisked egg using a pastry brush. Cool shell 35 minutes. 7. FOR THE FILLING: Trim 1.5 inches off each asparagus stem. Add these trimmed stems to the cream and milk and boil over medium heat. Strain and let cream cool. Discard trimmed pieces. Cook onions in 1 tablespoon of vegetable oil in a medium pan or skillet over medium heat until tender. Set onions aside to cool. 8. Place cornstarch in large bowl with 2 tablespoons milk and whisk to form a smooth paste. Whisk in cooked milk and cream, eggs, cheese, salt, pepper, nutmeg, and cayenne until mixture is smooth. Stir in the onions. 9. 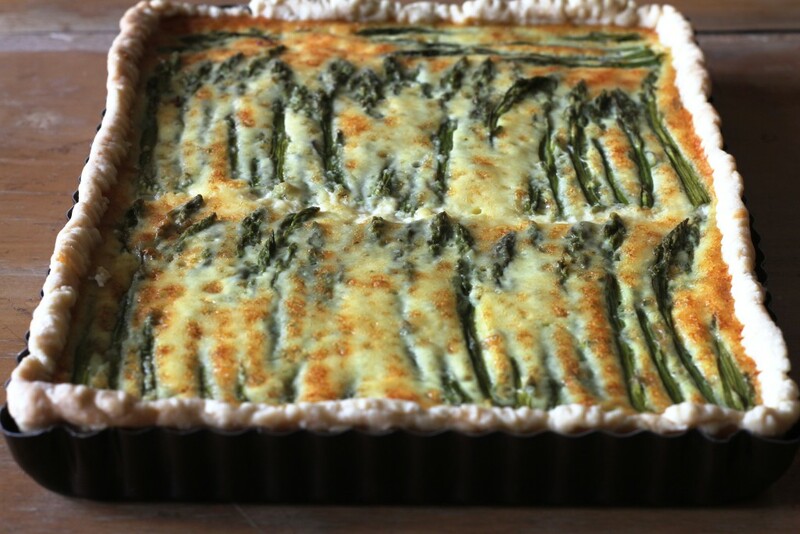 Arrange the raw asparagus vertically inside the quiche pan laying one next to the other over the pastry if using a rectangular pan and concentrically if using a round pan. Pour the cream and onions mixture over the vegetables. Gently tap pan on countertop so the mixture settles and covers the asparagus and dislodges any air bubbles. 10. Bake until top of quiche is lightly browned 1 hour until pastry edges are golden and the filling jiggles a little when pan is shaken. Use a toothpick to ensure the filling isn't still oozing liquid. Remove pan and let rest about 30 minutes. Custard will continue cooking as it cools. 11. 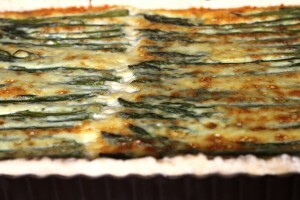 When ready to serve, use sharp pastry knife remove quiche from pan, slide quiche onto serving plate. Cut into wedges and serve. Puree onions, tomatoes, green chillies, garlic and ginger to a smooth paste. Heat oil in a large dutch oven type pot on high heat then add whole garam masala spices. Sauté 1 minute then drain and discard whole spices. To the remaining oil add pureed onion and tomato masala and cook for 15 minutes stirring on and off to prevent burning. When the pureed masala is dry and reduces to half its original volume, add the powdered cumin and cook 30 seconds. Add coconut milk with turmeric, ground coriander or cilantro leaves and drained rice. Stir gently. Add hot water and 2.5 teaspoons salt. Cover and cook on a slow gas about 15-18 minutes until rice is nearly cooked. Switch off flame, stir in prawns, cover tightly and let cook in its own heat. Fluff up rice, sprinkle with fried onions and serve warm. 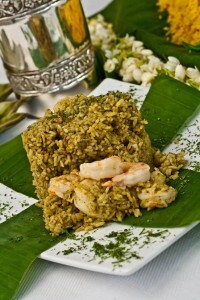 If using potatoes or hard boiled eggs garnish pulao with them before serving. Serve with lime wedges. The Bene israeli Jewish communities of India have a fascinating and delicious culinary heritage. 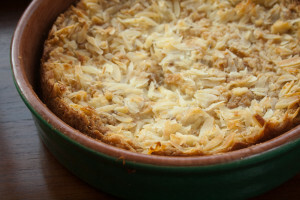 As the mixing of milk and meat is not permitted by the observant this bread pudding is made with coconut milk and can be served at a meal with meat. Its ideal for anyone with lactose intolerance. Preheat over to 325 degrees. In a 9 inch round baking dish lay down the bread pieces packing them together tightly. Beat eggs, vanilla, cardamom or nutmeg, rosewater, sugar, coconut milk, 1/2 cup water together. Stir in raisins and coconut flakes. Pour over bread, press down so all the bread is evenly soaked and let sit at room temperature for 20 minutes. Stir in ½ cup water if mixture is too dry. Top with almonds or cashews. Bake until golden brown and set. A toothpick inserted in the middle should come out with moist crumbs clinging to it but the pudding shouldn't ooze liquid. 1 tablespoon red chilli flakes (optional or to taste). Toss all these ingredients together in a food safe plastic bag and ensure that all the pumpkin is evenly coated with spices, herbs, butter and oil. Add a teaspoon of salt and toss again. Empty bag into a roasting pan, cover with foil and slow roast in the oven at 325 F for 35 minutes. Open foil and continue cooking at 375 until pumpkin is golden and tender. Season and serve. If you don't have an oven heat butter and oil on a slow flame in an oversized non stick saucepan. Add onions and chili flakes and sauté 2-3 minutes on medium flame. Add garlic and sauté 1 minute. 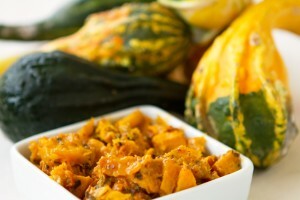 Add red pumpkin pieces and herbs of your choice and cook until tender, tossing regularly. You may need to add some water to prevent burning. Season and serve warm. 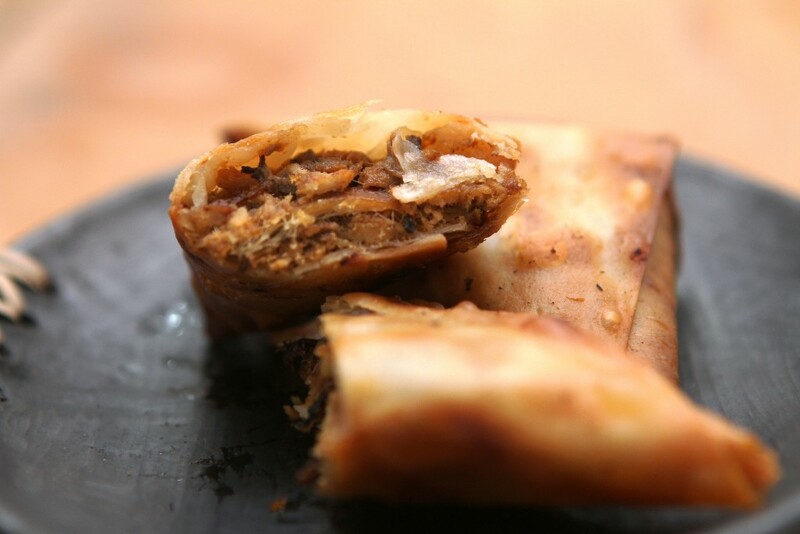 Its raining and there is nothing better than samosas and hot chai. This is a different (zara hatke!) 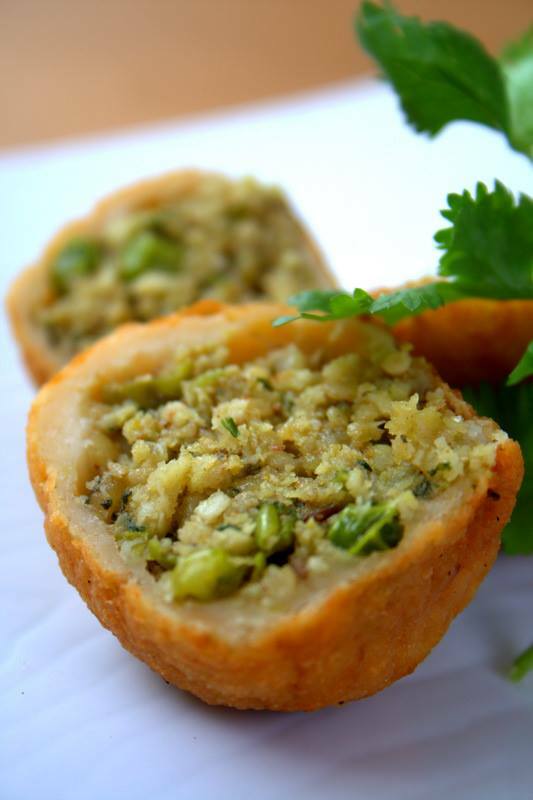 take on an Indian classic and its yummy. Cook onions in a teaspoon of vegetable oil in a non stick skillet or frying pan until caramelized on a medium flame. Combine shredded chicken or tempeh with bbq sauce, red chilli powder and cook over a slow fire until mixture gets a little sticky. Cool completely and stir in cilantro. Taste for salt and spice and adjust flavors. 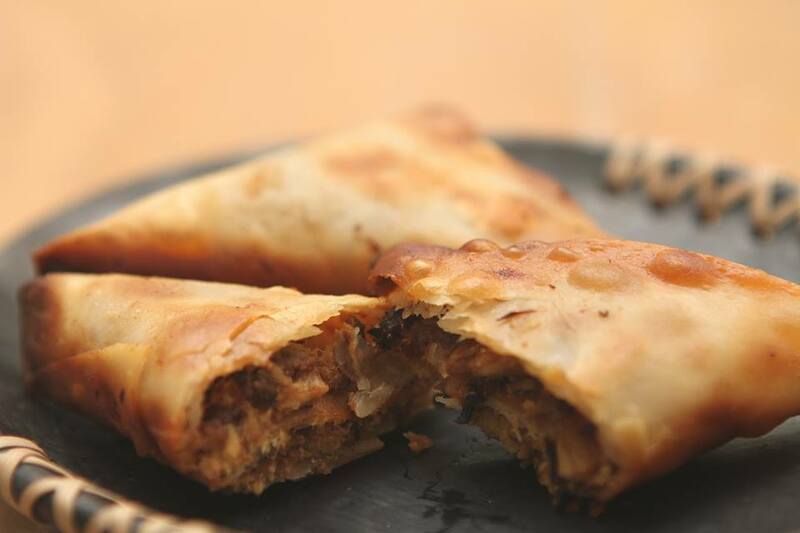 Remove samosa paanpati from the refrigerator and keep covered with a slightly damp and clean kitchen towel. You can also use fillo pastry and bake these samosas. Place a samosa paanpati on a clean surface and put one tbsp in the right hand side Turn it over to the opposite side to form a triangle. Keep repeating these turns until you get to the end of the strip. Fold and seal the tip with some sticky flour. There are several diagrams online for how to roll samosa paanpati. Deep fry in hot oil until golden and serve immediately. Drain completely. Serve it with the orange mint tea as a snack or as a passed appetizer. Fresh peas and coconut are a classic combination in Maharashtra. Serve these as a snack with tea or coffee or as a side dish. If you are pressed for time you can fry them ahead and leave them to warm in an oven. If you have health restrictions please consult your doctor before you enjoy this recipe. 1. On a medium flame roast the coconut,coriander seeds, cumin, khus khus, caraway seeds, cloves, peppercorn, cinnamon stick and ginger in one tablespoon ghee or oil. Roast until fragrant about 3-4 minutes, stirring regularly. 2. Cool and grind to a smooth paste. Add green chillies and grind again until smooth. 3. Add the peas to the ground spice paste. Add one cup water and cook until peas are tender and dry. Cool completely and stir in chopped coriander/cilantro leaves. 5. Place one ball in the center of your palm and flatten to form a disc. 6. Fill the center with 1.5 tablespoons of cooked peas then bring the ends of the potato disc together to enclose the peas. Repeat with remaining balls. 7.Coat cutlets in breadcrumbs and fry in 2 inches of hot vegetable oil until golden on a medium flame. Drain and serve warm with ketchup or green chutney or yogurt and peanut sauce. 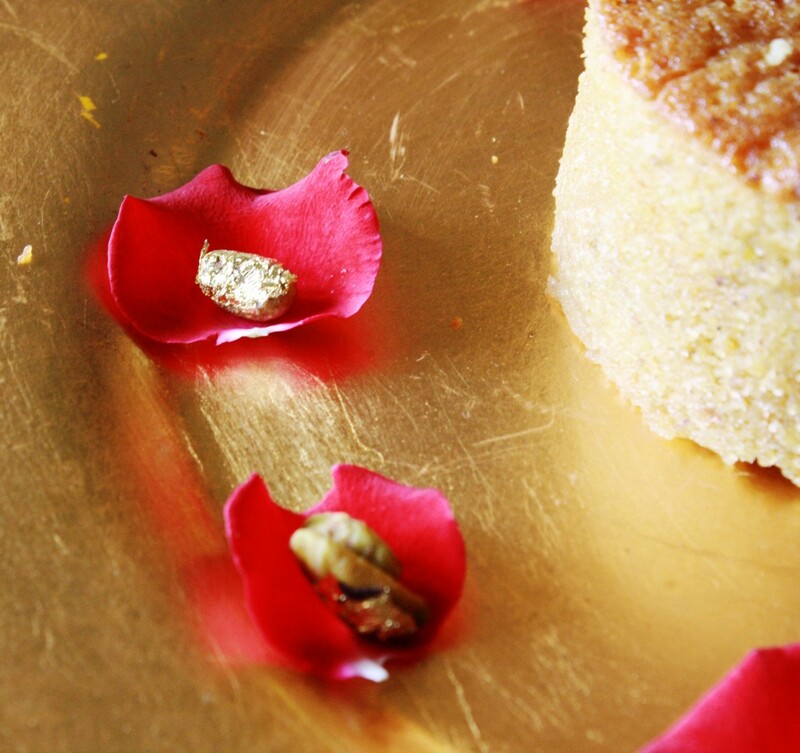 This is a luxurious cake with an intense pistachio flavor. 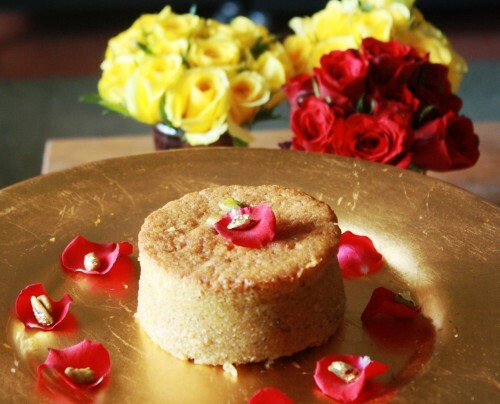 It's texture and density is reminiscent of the Mawa (milk solids) cakes sold at Irani cafes. Serve it with espresso or green tea as a snack or at the end of a formal dinner. Arrange oven rack in middle position and preheat oven to 350°F. Butter 9-inch-diameter round metal pan and line bottom with waxed paper. Butter paper, then dust pan with flour, knocking out excess.